Rookie status of some still to be reconciled. Please be reminded that Trophies for those who have won their class but have not claimed it on race day have up to two months to collect them from the executive board or before the next event.As such if they are not collected they will be recycled. 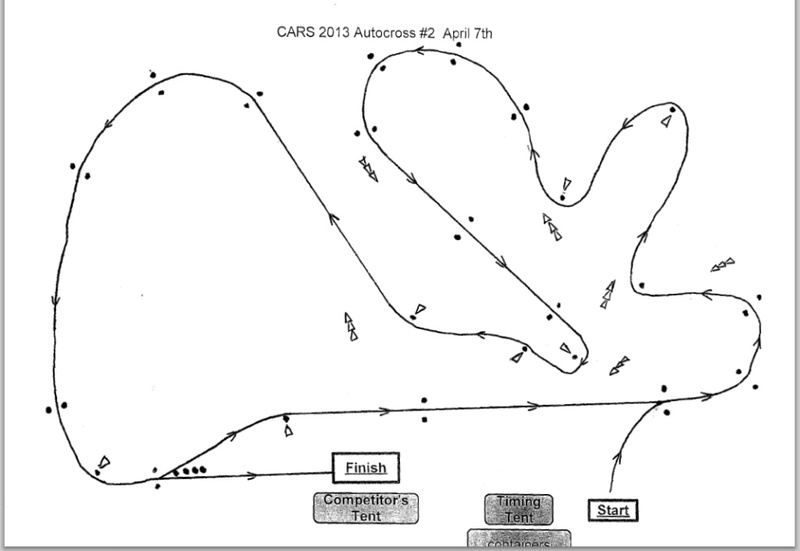 Come join us for our Second Autocross Competition event for 2013 on Sunday April 7th, 2013. We would like to make mention of one of our seasoned competitors Devi Nath who is competing in Rally Trinidad who has made the fastest time in the 2wd class in his Toyota Starlet.It goes to show with an Autocross background the heights of driving excellence you can achieve amongst even more powerful machinery.GO DEVI!!!!!!!!!!!! Remember as with the previous we are doing six timed laps for the course that will be provided. Arima Race Club car park! hmmmm...wondering if i'll get to use the white car again?? looking forward to my first try at an anti clockwise course! I could see that course making me DNF champion! blacktriple_s wrote: 2 laps, i'm assuming? 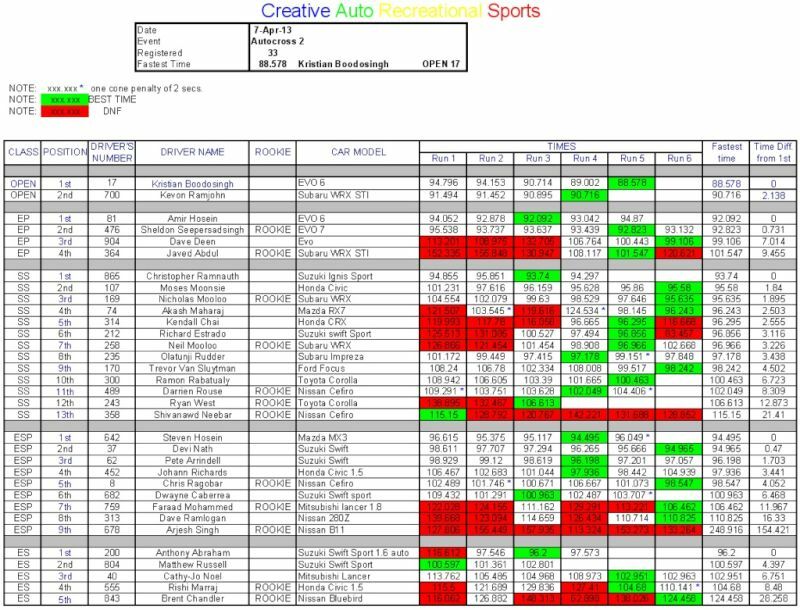 MG Man wrote: I could see that course making me DNF champion! how come you have a choice? is it that the classification failes by favoring you? That is putting you in a lower class, when you're competitive in a higher one? Anyone can choose to run in a higher class if they want to. My car is an ES car. I can run in ESP and that way if I decide to use race tyres later on I wouldn't have lost points from these earlier events. likewise we not seeing solodex men in d&w, are they afraid of barriers?? ^truth spoken there...i really want to enter a few d&w events also this year ( while not missing a dex) and that is proving to be very challenging, especially when most d&w events are usually the following weekend.. This is true for me, better yet if I could have someone with a red flag run ahead of the car, it's difficult to remember the course when you getting senile. Thank God for the markings on the gear shift knob. @#$, I now realise why I missing gears, my gear shift knob dosen't have any markings. Thanks to CARS and its executive for a well executed event. There seemed to be a healthy number of entrants today and it was a nicely designed course which proved to be a challenge for me. I put so much thought into the harder parts of the course that I took it for granted that I didn't need to double check the 'easy' part (the gates to switch to lap 2/finish). Unfortunately I wasn't able to stay to complete my last 2 runs though. It appears that one of the consequences of having 6 runs (which I really enjoy) instead of 4 this year is that it takes a little longer for all groups to complete their runs. It was about 5:30 and I had already planned to leave by this time. Perhaps I'll free up my evening for future events to ensure I'm able to make the 6 runs as well as stick around for the prize giving. I certainly enjoyed myself as usual though and look forward to the club's next event. it had prize giving ? Ignorant Ignis wrote: it had prize giving ? I'm really not sure.. I assume they did.